Power the backbone of your Java Social Network with the Stream API and Stream for Java client. Speed up your development. Stream supports feeds for millions of social apps. 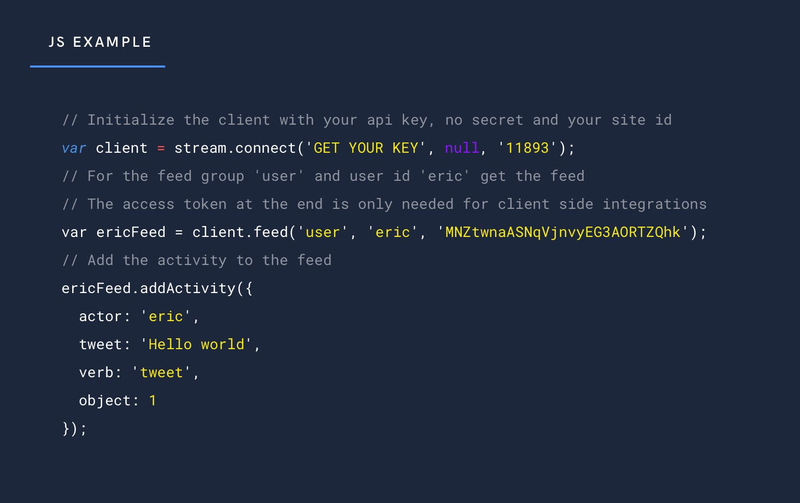 Java is great for building social networks and we want to make it as simple as possible to leverage Stream Feeds in your app. Java is a language and that is widely used in enterprise systems and web applications. It has been around since the mid-nineties and it is actually the first programming language learned by some of Stream’s development team. Java can be found in use just about everywhere on earth thanks to it’s place at the heart of the open source Android mobile operating system. Nowadays it is an extremely popular language for both rookie developers and veterans at large internet companies like Google. Java was built for Object Oriented Programming from the outset. This gives the language a consistent feel and makes it both easy to learn and suitable for building complex applications like social networks and e-commerce. The platform conveniently includes a rich suite of built-in libraries which help when building multi-user web applications and integrating third-party Web APIs such as Stream. Although in the early days it was not exactly easy to deploy and host Java web applications, it’s now quite straightforward. PaaS providers like Heroku, Amazon Web Services, and Google Cloud Platform make it cost effective and easy to scale Java applications. So it’s a smart choice. Our open source Java client was in fact a contribution from our amazing developer community. The developer who took the plunge and got it all started was Alessandro Piere. We quickly realised his awesomeness and it wasn’t long before he joined Stream full-time! We now work on the API Client from the stream-java Github project. Continuous integration is via Travis and we publish packaged releases to the Sonatype repository. Contributions in the form of issues, feature suggestions and pull requests are most welcome. mail_outlineContact us if you're using Java and want to be featured.